It’s been a hectic few weeks with birthdays, school holidays and wedding plans and as a result, I confess, I’ve neglected my blog. Furthermore, I suspect this will be a regular occurrence until September! Google won’t be happy with me. So what have I been up to? Well, apart from having the odd facial , walking the dog, entertaining children, feeding my fitness habit and spending lots of money on wedding related things, I’ve been busy on the strategic side of the business. Thanks to the lovely Janice Ross I have a renewed focus and I now know which direction my business should take. I need to aim high and not get bogged down with low level admin. I think when you start out in business you’re often happy to take any work that comes your way. After a while, you re-prioritise and think about why you made the jump into self-employment. For me, money isn’t the key motivator, it’s all about being able to do something I enjoy, from the comfort of my own home, whilst feeling challenged. My number one priority remains my family. That’s why I am treating this year as market research as I still have my youngest at home. And what a year of market research it has been. I have an amazing website up and running, thank you John Harrison. 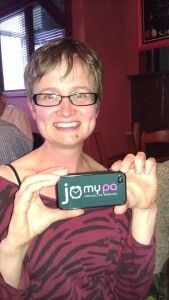 I have a fabulous brand, thank you Jenni Sime/Anchor Point Design. And I have a small, but growing, portfolio of customers. I have had many referrals and lots of positive feedback. What more could I want! When it comes to September, the magic month when the youngest starts school, I’ll be in a position to launch an attack on my target customers. I have a hit list and I’ll be working my way through it. The sky is the limit, I haven’t spent over 20 years in the business to do someone else’s filing. I’ll be focusing on high level support to top execs in the region (and beyond hopefully). Spread the word – if you know of any small or medium companies enjoying a growth spurt – recommend me. Maybe the office junior can’t cope with their needs any more, maybe they need help now they are exporting, maybe their Chief Executive is starting to travel more. Key is to remember that I am a Personal Assistant – I just happen to be a virtual one. I am ready to take on the world and reach for the stars. Roll on September!